5 Steps to become St Lucia’s day savvy from Skandiblog. St Lucia’s day is a very important date on every Scandinavian’s calendar – and is a celebration not to be missed! If you aren’t Scandinavian or wonder what it is all about – fear not! We have 5 steps that will ensure you are St Lucia savvy ready for the big day. 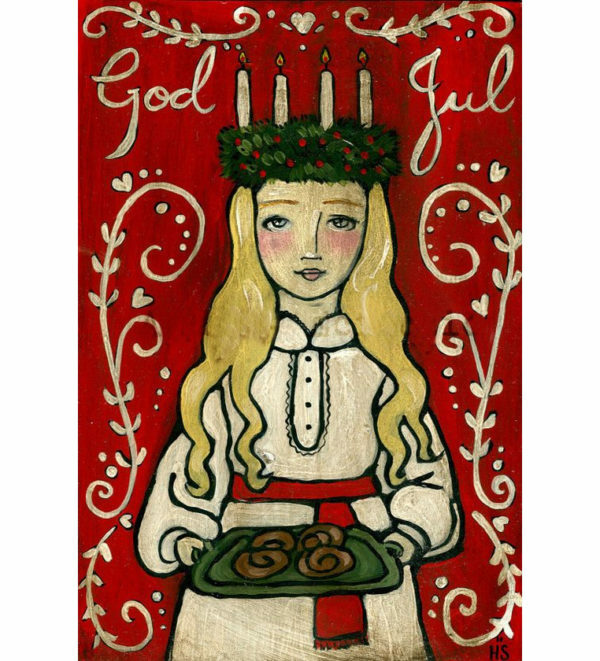 1 – Know your Lucia from your Lussekatter! Here is a super fast run through of the day and what it means! > Who is St Lucia? – St Lucia or Sankta Lucia was a martyr from 300AD. She is commemorated on this day for bringing food and aid to hiding Christians in need during terrible times. The food is represented by cinnamon buns called ‘Lussekatter’ or ‘Lussebullar’. Lucia also created a crown with candles to light her way through the darkness, which is replicated on the day as part of the girls costumes. > When is it celebrated? – 13th December, it signals the start of the Twelve Days of Christmas. > What is it celebrating? – St Lucia’s day is traditionally to celebrate the coming of Christ on Christmas day – to bring light from the darkness. > Why Scandinavia? – Scandinavians celebrate this the most, as it is most anticipated with the presence of their long dark winters. 2 – Dress up the Lucia way. St Lucia’s outfit is worn as costume by girls on the day, including a white gown and red sash. Each girl has a wreath crown adorned with candles. Traditionally the candles are real, but of course – fake ones are also used in some crowns. Here is a lovely wreath tutorial by Nourishing Joy which includes real candles – not for the faint hearted! 3 – Lay the table. As with any celebration, food and drink are very important. 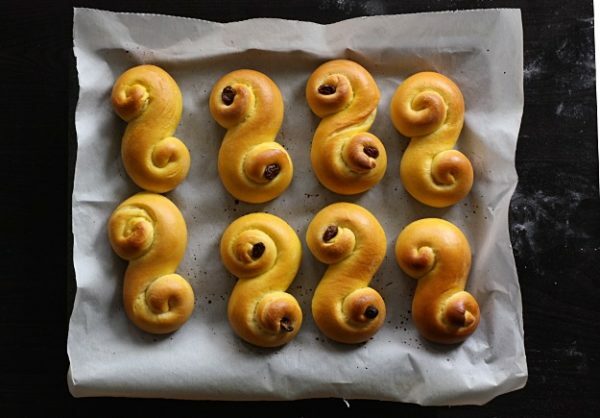 St Lucia’s day comes with its traditional dishes, including ‘Lussekatter’ – saffron buns. These are traditionally handed out by the eldest daughter, who dresses up as ‘Lucia’ in the household on the morning of St Lucia’s day. Here is a Lussebullar recipe from Skandi Kitchen. If you’re looking to create a St Lucia spread – look no further than The Lala’s tutorial for hosting the perfect St Lucia’s day brunch! 4 – Warm up those pipes! As you may have guessed – there is singing involved in the St Lucia’s day celebrations! To get you prepared, here is a video of a choir of girls singing the most popular ‘Sankta Lucia’ song. ‘Sankta Lucia’ describes how Lucia brings light to even the darkness of Winter – here is a version with an English translation. 5 – Finally.. Join in! Time to dress up, take what you’ve learnt and join in with the Lucia celebrations! If you’re in London this Christmas, and want a slice of the action – then look no further than the Asylum Chapel. 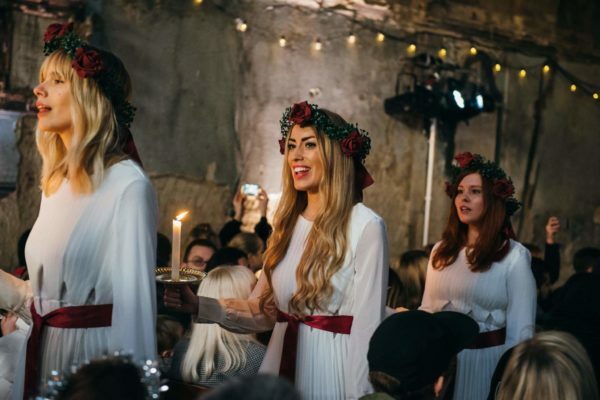 London Swedes are hosting seven St Lucia shows, where a choir will be singing, and you can enjoy plenty of sweet treats along with a healthy dose of Glogg! For more St Lucia visual inspiration, visit our Pinterest board here.